For goodness sake, stop opting for the store-bought dessert whose ingredients are fake. Your health and wellness is at stake. 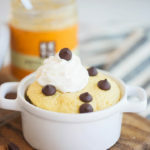 Instead, try our Perfect Keto Butter Mug Cake, which is not only delicious, but unbelievably easy to make. These healthy fats, along with the perks of eggs and almond flour make this cake a health food, not just a treat! Macadamia nuts are 75% fat and have one of the lowest carb counts. They contain 21.2 grams of fat, 2.2 grams protein, and 1.6 grams net carbs per a one-ounce serving. Cashews contain 12.4 grams of fat, 5.17 grams protein, and 7 grams of net carbs per a one-ounce serving [*]. Coconut butter, not to be confused with coconut oil, contains 9.6 grams of fat, 1 gram of protein, and 3 grams of net carbs per serving. MCTs (or medium chain triglycerides) are one of the best fuel source for ketoers. They’re digested quickly and don’t require any other enzymes to be absorbed by your body, so your cells can use it for energy almost immediately. It also raises your blood ketones and helps keep you in ketosis. Eggs are not only an amazing source of protein, they’re also rich in choline, a nutrient that greatly assists in liver and brain development. After it’s digested, choline turns into acetylcholine, an important brain neurotransmitter. Choline is an essential nutrient, which means we must get it from our food, and eggs are one of the few excellent food sources. Eggs also contribute to joint and skin health because they contain lutein and zeaxanthin[*]. Almond flour provides all the health benefits of raw almonds. It helps reduce high blood pressure by increasing blood flow, which contributes to optimal heart health[*], and it regulates blood sugar by decreasing high insulin levels in your blood[*]. You can also use almond flour to make endless keto desserts like this one. This recipe couldn’t be any easier. In fact, you’ll probably think you forgot some steps, but you didn’t. It really is this simple. Mix the ingredients, pour them into your ramekin, microwave, and enjoy this decadent treat that will keep your keto needs appeased. Grease a small mug or ramekin with non stick spray or butter. Pour all cake ingredients (except optional chocolate chips) into a small bowl. Mix well until smooth. Pour into prepared dish. Once in prepared dish, microwave on high for 2-2:30 minutes.